Shin splints – what are they and how can I get rid of them? If you’re a runner, or exercise regularly, you likely know how shin splints feel, but you may not know why they occur, or more importantly, what you can do to get rid of them. In this blog we talk about what shin splints are and what can be done to treat them so you can keep exercising pain free. When you increase your training work load too quickly, or run a lot on hard surfaces, or just don’t give yourself enough time to recover between workouts you can damage the muscle that attaches to your shin and experience anything from a mild discomfort to serious pain that impacts on your ability to walk – damaging this muscle is known as shin splints. As we mentioned, over-training or running on hard surfaces could trigger shin splints, but the same type of exercise may not cause shin splints in someone else, how come? Well, when understanding shin splints, you need to not only take into account the external factors such as training frequency, or footwear, but also the person’s biomechanical movements. There are many different biomechanical movements involved in running or exercising that may not be properly balanced and be contributing to your shin splints (e.g. you have poor core stability or decreased flexibility in one or both of your ankles). This is why it is important to see a trained health professional when dealing with shin splints – unless you accurately diagnose all the factors contributing to your shin splints, there is a very good chance they will come back if you just rest until the pain goes away (which is what most people do, and not surprisingly, is why most people struggle to get rid of shin splints). How do I know if I have shin splints? It’s pretty straightforward, if you exercise regularly and find you have a dull ache starting to flare up down the front of your shins, or up the back of your lower leg starting from your ankle and moving up to your calf, you may have shin splints. These areas can also be painful to touch or when applying moderate pressure and you should take action to resolve your situation before it gets worse and impacts your daily movement such as walking or getting out of bed. What treatment is available for shin splints? The important thing to keep front of your mind when resolving your shin splints is to accurately diagnose the root cause and then put an effective treatment plan in place that ensures they don’t come back – this is not as easy or obvious as it sounds. First off however, it is important to rest and ice your shin splints. This initial treatment phase is crucial as it stops your shin splints from getting worse and gives your body the much needed opportunity to heal. The tried and true soft tissue treatment of rest, ice and protection is how you should first start your shin splint treatment, but this alone won’t stop your shin splints coming back. It is important during this healing process that you stretch, lengthen and mobilise the muscles running down your shin that were injured. This will help strengthen them and better position you to safely face the next challenging workout without injury. Your Podiatrist can advise you of the types of exercises, and their frequency, to optimally strengthen the specific shin muscles that you have injured. 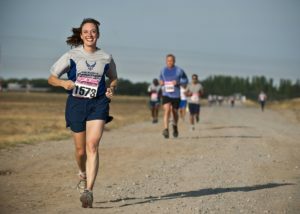 A side note for the muscle strengthening phase is that your Podiatrist will need to also consider your biomechanical movement – some shin splints are caused by poor biomechanical movement and may require the assistance of orthotics or a specific exercise plan that corrects your biomechanical imbalances. Finally, you need to get back in the game… but rushing back too soon, even after you have rested, iced and strengthened your shin muscles, can still lead to injury if you don’t treat this final stage of rehabilitation with caution and respect for your body. You should discuss with your Podiatrist what training goals you have, and your timelines to reach them, so the two of you can work together to develop a “return to fitness” plan that meets your needs without risking further injury. Left untreated, shin splints can become a serious issue that not only stops you from training, but can also cause you serious pain when walking. Don’t risk it, if you think you have shin splints, you should do something about it before it gets worse and ends up taking you longer to repair and rehabilitate. 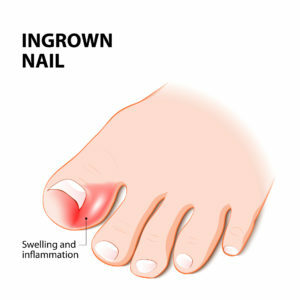 If you catch an ingrown toenail in its early stages, you may be able to self-treat your situation at home and not need to see a Podiatrist. If you think you may be in the early stages of an ingrown toenail, you can try soaking your feet in warm water a few times a day for about 15 minutes. This will soften the nail and allow you to place a small piece of cotton wool under the nail – this will hopefully provide a successful barrier between the nail and your skin to stop it growing inwards. You need to repeat this process for a few weeks (replacing the cotton wool each time you soak your feet). If you find your ingrown toenail is getting worse, don’t risk it any further, book in to see a Podiatrist as soon as possible. If your situation isn’t too far progressed, the Podiatrist should be able to non-surgically trim and cut away the troublesome piece of nail without too much hassle. In more progressed cases, you may require a local anesthetic to remove the offending piece of nail – the procedure is very safe, you walk in and walk out and get back to normal life. As we said earlier, if you dread the thought of a needle and scalpel, Bellevue Podiatry offers the BS Brace – a painless and effective way to get rid of your ingrown toenails, click the link to learn more. It’s that time of year again when the temperature in the morning leaves our feet cold and seeking the warmth of a nice hot shower, electric blanket, hot water bottle or heater… but have you ever had itchy red lumps on your toes in the winter time that drive you up the wall? For some of you this image of itchy red lumps on your feet brings back memories of our childhood as it is more common in our younger years when we would run around without shoes or socks on in the freezing cold. This issue also arises in elderly people and can have more serious effects like ulceration and blistering of the chilblains (a photo of someone suffering from Chilblains is shown below). Chilblains are a reaction to severe cold weather when our capillaries shrink to keep the warmth of our blood close to our bodies and not close to the skin where heat is lost. When we rewarm the feet too quickly this can lead to leakage of fluid and blood into the toes leading to chilblains. The fluid and blood in the tissue can cause redness and cause irritation and itching. I’m not sure if its a chilblain, what do they usually feel like? Chilblains usually cause discomfort and pain and an extreme need to scratch the area. They usually appear as red / purple lumps and in extreme cases they can blister and scab over. They usually last for a week or longer and subside with appropriate treatment or warmer weather. They are usually present on the extremities (toes, fingers, nose, ears) and over bony areas (knuckles). Yep, sounds like me! How do I stop myself from getting them? I have a chilblain, what should I do? It’s important that you make sure it is a chilblain before commencing treatment. Our podiatrists are able to diagnose chilblains with a few clinical tests and asking questions about your lifestyle. We can then provide you with a treatment and prevention plan to make sure you don’t get them again, and more importantly they don’t get worse and blister. Podiatrists around the world can agree that effectively treating fungal nail infection is not always an easy task. Most over the counter treatments have a low success rate, especially for serious cases of fungal toenail infection, and the probability of the nail fungus returning is quite high. When treated directly, most nail fungus can be successfully cured with an over the counter fungicide, similar to what you would use to treat a case of athlete’s foot. Most people would agree that treating athlete’s foot isn’t difficult, so why does nail fungus, a similar fungus to athlete’s foot, create so many issues for successful treatment? The difficulty in effective treatment is due to the nail itself and where the nail fungus infection is located – being able to get under the protective nail to treat the fungus is no easy task. Our toe nails are there to act as a structural support for our toes and provide more grip. They are designed to be strong and durable, but this unfortunately means our toe nails provide a safe and protected environment for the nail fungus infection to thrive. And adding insult to injury, our toe nails are made out of keratin, which is exactly what the nail fungus loves to feed on! It’s no wonder it’s not always easy to effectively treat. It is estimated up to 12% of the population are effected by toe nail fungus. Topical nail paints usually require daily application until the nail grows out – It can be difficult to reach the toe nail fungus infection in serious cases with topical paints. Oral anti-fungal medication are not suitable for everyone and should be discussed with your local doctor as it can have harmful effects if not used in the right circumstances. Clearanail a state-of-the-art micro-drill that creates almost-invisible holes in the nail plate to allow an anti-fungal agent to reach the fungus under the nail and kill it. We have had great success in our clinic using this effective and painless method to kill toenail fungus. Laser therapy is typically recommended for serious cases of toenail fungus infection and usually requires multiple sessions as part of the treatment plan. Laser therapy can add up to be an expensive exercise. Surgical removal of the affected toenail under a local anesthetic and then treating any fungus left behind is considered in extreme cases. Before undertaking this procedure you should seek a second opinion from your local health practitioner. As you can see there are a number of potential remedies for toenail fungus infections out there, so it is important that you speak to an experienced Podiatrist about which treatment will work best for your situation – and the sooner the better. The longer you leave a toe nail fungus infection, the more difficult it will be to get rid of. 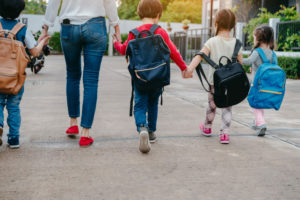 Welcome back – in our last blog we discussed the main causes of plantar fasciitis (which is just the technical name for an injury to the structure that runs along the bottom of your foot). 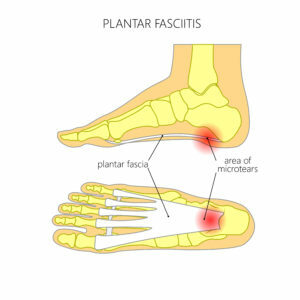 We also discussed that plantar fasciitis usually strikes first thing in the morning when you get out of bed, giving you heel pain that can feel like you have just stepped on a sharp pin, and what the main causes of the heel pain are. In this next blog, we will discuss the various effective treatments that are available for plantar fasciitis and underline the importance of ensuring that your heel pain is accurately diagnosed so the right treatment plan can be put in place – a very important step in ensuring you get pain free fast. As mentioned, while plantar fasciitis is a very common cause of heel pain, it must be accurately diagnosed to ensure the right treatment plan is put in place. Not all heel pain is due to plantar fasciitis. In fact there are a number of other conditions that could cause pain around the heel region, which need different treatments. This is where the skills of a qualified Podiatrist comes into the picture – we have the education and experience to accurately diagnose the cause of your heel pain and tailor a personal and effective treatment plan to get you back on your feet pain free. Our podiatrists will firstly ask you a lot of questions about your heel pain and also find out a bit more about your activities, work and lifestyle. We then ask the question, why you? What is happening to you that is causing you to get heel pain and not the guy sitting in the desk opposite you at work? This is where things get a bit more technical and when we start looking in to the way you walk and the way you foot moves. We use the assistance of modern technology (good old video analysis) to watch you walk. There are other assessments we do and are specific to your particular heel pain. · Plantar fasciitis stretching: starting with gentle stretches for the calf and bottom of the foot can often relieve the pressure on the plantar fascia and provide the start of heel pain relief. · Plantar fasciitis exercises: the source of your plantar fasciitis may be a lack of strength in key supporting muscles in the foot and lower limbs therefore it may be necessary to strengthen these muscles with specialised exercises to ensure your plantar fascia is able to function effectively and without pain. · Plantar fasciitis taping: an effective strategy for relieving heel pain in the immediate term that can supplement longer term strategies. · Custom made orthotics: shoe inserts designed for you to alter your foot function and take pressure off the plantar fascia. Now that you know what plantar fasciitis is, what causes and how to treat it, we trust you can now see that you really don’t have to put up with heel pain any longer. Experience tells us that ignoring it will likely only make it worse, so if you have started to get a sharp pain in your heel after long periods of inactivity, you should take action and book in to see a podiatrist before any further damage is done. Please feel free to give us a call during business hours on (03) 9457 2336 or book online now – we are here to help. We are really excited to have just launched our new website at the end of April, with more information about common foot problems, of course our new blog, products that we sell in the clinic and more information about our footwear range. We will be updating our information on a monthly basis and also keeping our blog up to date on a weekly basis, so make sure you check back regularly or follow us on our Facebook page to be updated about any new blogs. Our first 8 blogs will be all about footwear. Each week in May & June we will be talking about a different footwear topics. So to kick it off, let’s talk footy boots! I thought I’d kick off are first post by talking about football boots! We see a lot of foot problems in both soccer and Aussie rules football players. There are many reasons why these particular sports are so prone to foot problems, firstly because of the nature of the sport. They are high impact, high intensity sports and a lot of running is involved. Secondly, the choice of football boot greatly will affect how much support your foot is getting during a match. Thirdly, the playing surface. Particularly in the ground is hard or water logged, this can lead to injury. In this post we will focus mainly on the choice of football shoe, given you can’t really do too much to improve the grounds or conditions of the sport! Forwards: Consider a boot that has minimal weight for rapid movement and no laces or seems in your strike zone, preferably a grippy material. Defence: You may need more protection over your foot to avoid being hurt. Rounded studs might be best. Midfield: Light weight for endurance. Goalkeepers: Quick footwork is key so a light weight boot is best! Upper: Boots are usually made from either a synthetic material or from leather. Synthetic materials tend to be a bit lighter than your leather shoe, but leather tends to be a bit more comfortable as it conforms to the foot better. Blade studs: Grip better and promote speed. Great for increased traction. Round studs: Release a lot faster from the ground. Ideal for wet conditions. Moulds: Suited for natural or synthetic grass, but for drier conditions. Midsole: Some boots will not have a midsole which is a material that is placed between the outsole and the upper of the boot, providing extra cushioning. Unfortunately this can make a boot heavier as there is more material in the boot. This part of the shoe is preferable as it provides further support and usually is required to build the heel height. Innersole: This will provide some cushioning and preferably should be removable, particularly if you require orthotics down the track. Heel counter/height: The heel counter of a shoe should be stiff to stop your heel from moving around. Your heel should be higher than the front of your foot, particularly if you suffer from Achilles issues or in children, severs. It could also predispose you to lower limb injury. Need more advice on which boots to buy? Pain after or during soccer or football? Call us today on (03) 9457 2336.